↑ Grousset, Rene, The Empire of the Steppes, (New Brunswick:Rutgers University Press, 1988),159,161. ↑ M.A. 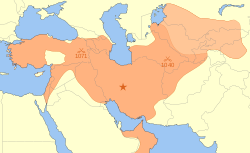 Amir-Moezzi, "Shahrbanu", Encyclopaedia Iranica, Online Edition, (LINK): "... here one might bear in mind that non-Persian dynasties such as the Ghaznavids, Saljuqs and Ilkhanids were rapidly to adopt the Persian language and have their origins traced back to the ancient kings of Persia rather than to Turkish heroes or Muslim saints ..."
↑ Jonathan Dewald, "Europe 1450 to 1789: Encyclopedia of the Early Modern World", Charles Scribner's Sons, 2004, p. 24: "Turcoman armies coming from the East had driven the Byzantines out of much of Asia Minor and established the Persianized sultanate of the Seljuks." ↑ Possessors and possessed: museums, archaeology, and the visualization of history in the late Ottoman Empire; By Wendy M. K. Shaw; Published by University of California Press, 2003, ISBN 0520233352, 9780520233355; p. 5. Jackson, P. (2002). Review: The History of the Seljuq Turks: The History of the Seljuq Turks.Journal of Islamic Studies 2002 13(1):75-76; doi:10.1093/jis/13.1.75.Oxford Centre for Islamic Studies. Bosworth, C. E. (2001). Notes on Some Turkish Names in Abu 'l-Fadl Bayhaqi's Tarikh-i Mas'udi. Oriens, Vol. 36, 2001 (2001), pp. 299-313. หน้านี้แก้ไขล่าสุดเมื่อวันที่ 16 ธันวาคม 2561 เวลา 18:32 น.